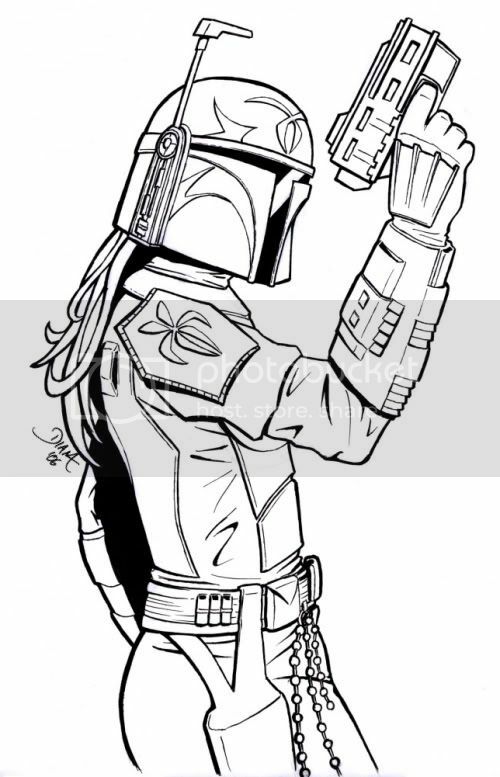 I was cruising my favorate Mando spots on the web and I decided to see some fan art. I hit this page and am checking out your stuff, which is awesome if I may say so, and what do I see. A couple of Mando'ade about to make some poor soul's day take a turn for the worse with a verp sniper rifle ala Walon Vau in Triple Zero. I was like no way thats awesome, maily because I designed the verp with Karen Traviss and am the guy who made her the life sized model. I recognized it right away and it was awesome to see it in your illustration. Thank you for making my day burc'ya! Ill be sure to check back. I wasnt a registered user of this message board until today. I just had to say thumbs up on that scene. It was depicted very well i thought. As soon as i saw it it gave me a flashback to that Vau scene in TZ. I liked the use of perspective and the contrast between the forground and the background. The traffic and the lights totally gives a sense of hight. Kandosii, ori'kandosi! Im working on fan stuff myself. Keep it up ner vod. Kandosii!! The beskar'gam looks good. Im curious as to the color scheme you are going to choose for her. I really like the the armor is discrete. Im not a fan of the Boobie/bootylicious mando women ive seen before. Im feeling the armor plate on the hand, its a cool addition. the clan markings look pretty sweet too. Good job burc'ya. I like this one too! Can't wait till it's colored. btw, just cause I've always been curious about this from other pics, what are the balls-on-a-string for? The ones attached to the waist? Decoration? I dont know myself, but I know that from experience that real soldiers use whats called in the Army ranger beads for keeping track of distance during land navigation. They look very much like that Id expect a good Mando to have a set when all the bells and whistles of tech are gone. Have to be able to do it the old fashioned way. WOW! Where did you learn to draw? 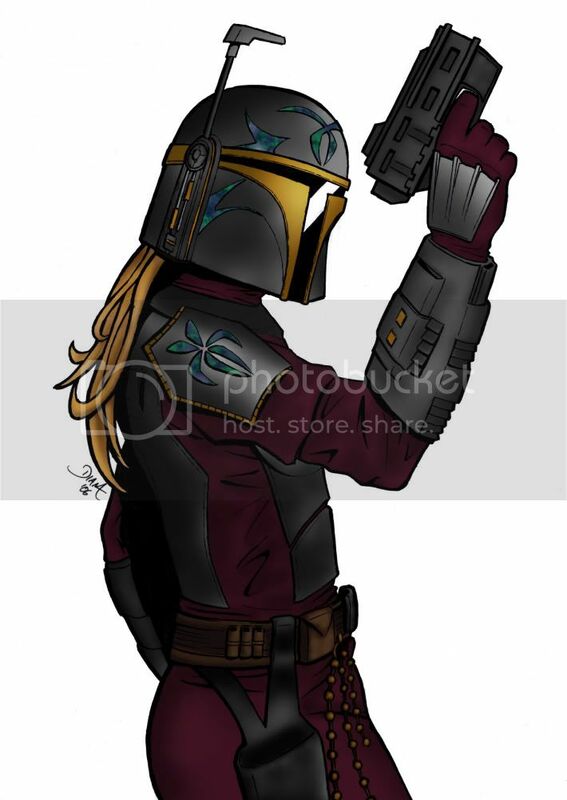 Is this the final design of your mando girl? Or is this a totally different character? Thanks everyone, so glad that you like this one! Kandosii!! The beskar'gam looks good. Im curious as to the color scheme you are going to choose for her. I really like the the armor is discrete. Im not a fan of the Boobie/bootylicious mando women ive seen before. You may notice in AotC that Zam Wessel has them too. webbing harness, pocket or map case. 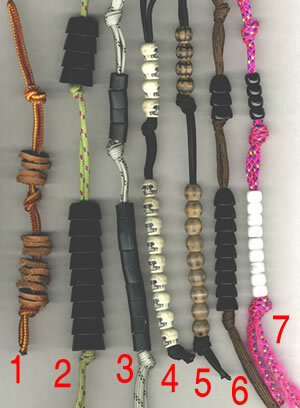 Made from tough Para cord and plastic beads." But before that I was always the lonely kid in the back of the room, doodling something. That's a totally different character, I tried making more specific details in this one as clan markings, pistol, armor, etc. Dude you are GOOD AT THIS!!!!!!!!!!!!!!!!!!!!!!! I know you can't see me blush beneath my bucket, ever! Surprising, I thought I had made it clear enough. OHHHHHHH.. I get it now. Now every time you draw a good picture, ARC is going to say "I love you..."
lol......... is that a sarcastic comment or is that true??? Hey Daenna have you ever tried drawing Slave 1?